Microsoft takes care of game lovers in the latest version of latest Windows operating system i.e. Windows 10. It is one of the best OS to play game because it is a very gamer-friendly operating system. But, sometimes it gets hard to play games on it because of some problems occurs while playing games on Windows 10. Crashing of system is one of the irritating issues while playing game, according to some reporting system crashes randomly while playing games or trying to run this game. If you’re suffering from the crashing problems on your Windows 10 computer/Laptop then try to apply some of the below given methods. This type of issue may occur because of outdated system drivers so that it is suggested to make sure that your windows 10 system is packed with updated drivers. Windows 10 system had issues with driver’s compatibility since day one, and those issues are not fixed yet. Go to Windows Update, or Device Manager, and check here that drivers are updated or not. It is necessary to install some additional software to run any game without any error, programs like DirectX and Java are the important software that helps the games to run on any platform without generating any issue. So, it is suggested to install all the necessary software, and after installing the game try to play the game again. In case you don’t know which additional programs you need to install in order to play your desired game, do Google or visit the official site of the game. Sometimes problems aren’t related to the system or any software, maybe it’s in system’s hardware. System hardware like the graphics card and more may affect the game or entire gaming session. So, it is recommended to check if your computer is ‘assembled’ with perfect hardware parts or not. If any hardware is affected or not compatible then replace it with a fresh one. There are lots of games that don’t support by the Windows 10, so it is recommended to have a look on the list of Games Compatible with Windows 10. How To Boost Game In Windows 10? There is only one solution, go to the third party game booster and enhance game FPS up to 50%, this app is one of the best utility in the manner to speed up any games on Windows 10. Even if the game is taking the most of the system resources properly, some more background programs can be running on the CPU or RAM. It can also result in some sudden crashes or shutdowns. For this, you can disable all those resource-hogging applications to reduce the load they used to put on the PC. Step 1: First of all, you have to right-click on the taskbar and then open the Task Manager. Step 2: Now select the Startup tab. Step 3: Now you can easily disable all unimportant and resource heavy applications. Step 4: In the last step, you just have to restart to PC and notice the changes. It is very difficult for malware to cause as severe issues like game crashes issue. There are several crypto mining malware which steals the CPU resources. For this issue, you have to perform a thorough scan with Windows Defender or any other third party antivirus you have at the disposal. Step 1: First of all, you need to open the Windows Defender from the notification area on the taskbar. Step 2: Choose Virus and then threat protection. Step 3: Now you can select advanced scan. Step 4: You can then highlight Windows Defender Offline scan. Step 5: Now at last, click scan now. If you are unable to fix the issue after applying all the above-given method and game is in the compatibility list of Windows 10 then you should try an automatic method. Download and install Windows Error Repair tool and run it on your system in the manner to fix all internal issue related to the registry, system files, dll files and more. It may also able to solve the driver related issue, it automatically updates the outdated driver so you don’t need to do anything manually. Try it once and see what happens, it will also boost your PC performance by fixing all types of issue. After going through the above section of this blog, you might have observed that you can try several fixes to repair computer crashes while playing game in Windows 10 error. All these fixes are the most effective ways you can try to get rid of computer crashes issues in Windows 10m with an ease. However, after fixing the issue if you find that your system is running slow then you can also try PC Repair Tool. This tool will help you speed up your PC. 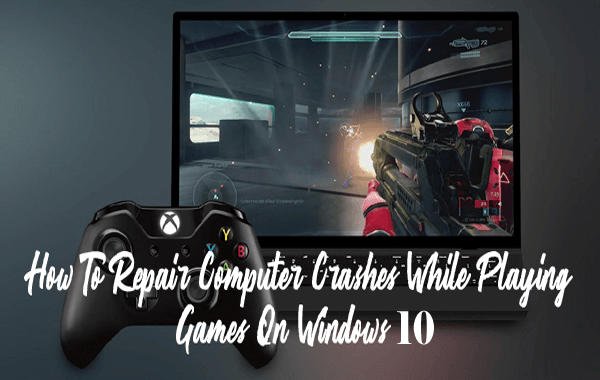 If you face any kind of computer crashes in Windows 10 while playing game then you should definitely try the fixes to resolve game crashes while playing games in Windows 10.